Includes: Our private tour of Erice and Segesta includes a private “driving guide”, private door-to-door transportation, entrance tickets to archeological sites in Segesta, entrance to church in Erice, taxes, tolls and parking. Departure Points: Palermo city center, Palermo dock for shore excursions. 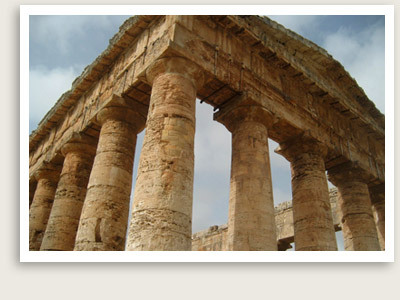 Enjoy one of the finest private guided tours or shore excursions of Sicily for Greek temples and architecture. Your first stop on this private escorted tour of Western Sicily will be the magnificent Temple of Segesta, the first Doric-style Greek Temple, set among gently sloping hills of yellow-ochre and brown. The temple was built by the Elimians, one of the most important Greek colonies in Western Sicily. The temple’s 36 columns are still intact despite several major earthquakes. 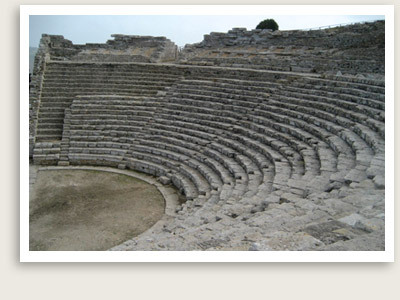 You will also visit a typical Greek semi-circular-style theatre, set on the rocky slope. Its seats face west towards the hills, beyond which you can catch a glimpse of the Bay of Castellamare. After your private guided tour of Segesta, your tour guide will then take you to the medieval town of Erice, situated nearly 3,000 feet above sea level and surrounded by ancient Elimi and Phoenician walls. In antiquity, Erice was famous for its temple where the Phoenicians worshipped Astarte, the Greeks venerated Aphrodite and the Romans celebrated Venus, respectively. Mount Eryx served as a point of reference for sailors, who adopted Venus as their protector. Erice’s hilltop twin castles of Pepoli, with foundations dating from both the Saracen and Norman eras, give the town a spectacular skyline. Both castles have been modified over the centuries, yet they retain their distinctively medieval character. You will enjoy a breathtaking view from the castle towers. You will also visit a 14th-century Gothic Catalan-style church featuring the famous depiction of the black Virgin Mary. You will wrap up the day strolling along the town’s charming old stone streets, stopping to taste the almond marzipan cakes at a famous pastry shop called Grammatico.